Consumer credit outstanding grew by a seasonally adjusted annual rate of 4.8%, $167.4 billion, in the month of November 2015, 0.6 percentage point slower than the 5.4% rate of growth recorded in October 2015. Consumer credit outstanding now totals $3.526 trillion. The increase in total consumer credit outstanding partly reflected an expansion in the outstanding amount of revolving consumer credit. Revolving credit, which is largely composed of credit card debt, increased by 7.4%, $67.9 billion, over the month of November, 7.3 percentage points faster than the 0.1% rate of growth in October. There is now $929.1 billion in outstanding revolving credit. The increase in total consumer credit outstanding also reflected an expansion in the outstanding amount of non-revolving consumer credit. Non-revolving consumer credit includes student loans and auto loans. According to the report, non-revolving credit outstanding rose by a seasonally adjusted annual rate of 3.8%, $99.5 billion, in November, 3.5 percentage points slower than its level in October, 7.3%. There is now $2.597 trillion in outstanding non-revolving credit. A previous post highlighted the rise in non-revolving credit outstanding. The recovery in non-revolving credit outstanding partly reflects an expansion in student loan debt outstanding, which expanded unabated through the recent recession. At the same time, auto loans outstanding have also increased. After contracting during the recession, the total outstanding amount of auto loan debt has grown. The recent increase in auto loan debt outstanding is due, in part, to an increase in new vehicle sales. 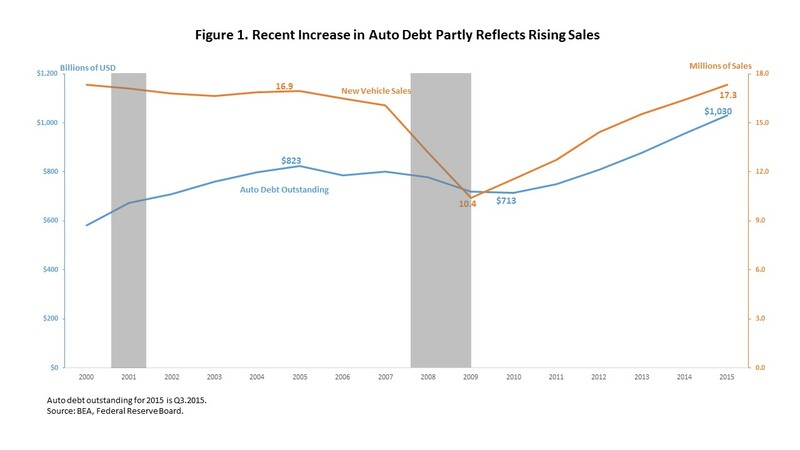 As Figure 1 above illustrates, the total amount of auto loan debt outstanding fell by 13% between 2005 when it reached $823 billion and 2010, when it settled at $713 billion. Since 2010, the total amount of auto debt outstanding has expanded by 43% to $1.03 trillion. Meanwhile, new vehicle sales, which fell by 39% between 2005 and 2009, 16.9 million to 10.4 million, rose by 67% between 2010 and 2015, ending 2015 with 17.3 million in sales. 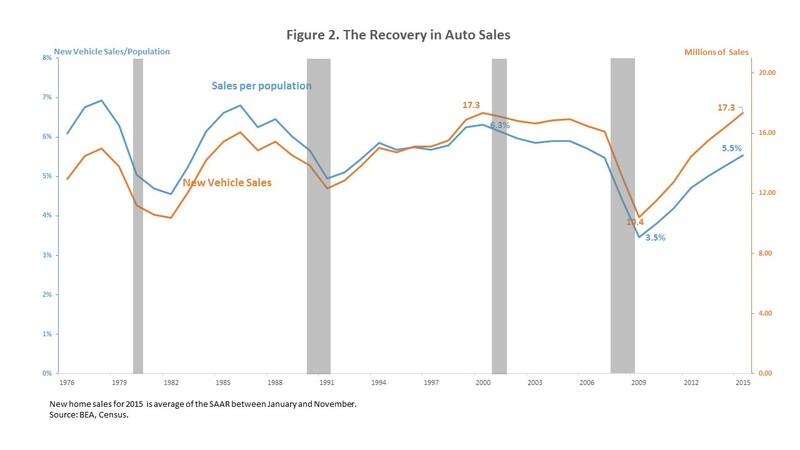 The pace of auto sales indicates that the recovery in the market has taken hold. Not only have the number of auto sales nearly returned to its previous peak level, but, its portion relative to the overall population is also growing. However, while overall sales have reached their last peak level, the share of sales relative to the population is still recovering. As illustrated in Figure 2, the decline in sales from 17.3 million in 2000 to 10.4 in 2009 coincided with a decreasing number of sales relative to the overall population, from 6.3% to 3.5%. However, since 2009, when the number of sales rose from 10.4 million to 17.3 million, its pace, relative to the overall population has expanded to 5.5%. Since vehicle sales per population are still below historical peaks then the number auto loans may have room to continue rising.